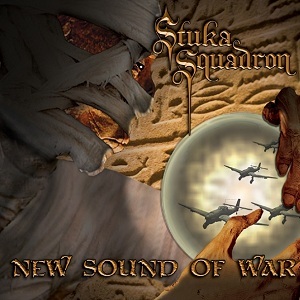 Stuka squadron are a London based band that combine World War 2 Germany with Vampires (seems like an obvious combination really doesnt it). They wear long German miltary leather coats, Iron Crosses, and Luftwaffe caps as well as displaying Vampire fangs to create a striking image. A striking image though is nothing without having the music to go with it, and Stuka Squadron aren't lacking there either - their live shows are always great and I thoroughly enjoyed their debut album (Tales of the Ost). Since the release of "Tales of the Ost" the band have toured the UK and also played their first shows in Czech republic and Germany, and have already confirmed their first festival appearance for 2013 - at Hammerfest. Since I enjoyed the first album and have seen the band live a few times then I was looking forward to hearing this new album, but with a bit of doubt - after all so many bands come out with a great debut album but then struggle to match it with their second album. I have to admit on first listen I was a bit uncertain about the new album but it's definitely an album that grows on you. One big positive with the new album is that the band have toned down the Iron Maiden influences and are starting to develop a more distinct identity - good as it was, the last album did have a tendency to sound like an Iron Maiden tribute band. One bit that seems weak to me is the production - the drums in particular seem to be lacking any sort of power or bass, and the album does suffer from that. Mixed with more power and bass this would be a great album instead of a good one. It's possible that the press were sent an unfinished version and this might be fixed for the release - I certainly hope so. The songs are great, and the lyrical themes of war and vampires that were present in the first album continue here. A great album that builds on their strong debut - well worth buying.